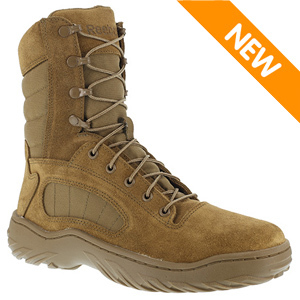 The Reebok CM8992 Men's Fusion Max 8in OCP ACU Coyote Brown Military Boot is Reebok's top of the line hot weather military boot. The Reebok Fusion cuts no corners and features an upper constructed of premium 100% cowhide suede and ballistic nylon fabric for longevity. Several comfort features make this one of the most comfortable boots to wear in the field. It features Reebok's patented Total Cushioning Technology and a more costly polyurethane midsole for years of service. This boot is made in the USA and compliant with AR-670-1 for wear with the U.S. Army's OCP ACU, scheduled to become the Army's working uniform in 2019.